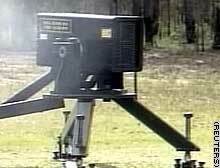 Metal Storm's high-speed gun, capable of firing at a rate of a million rounds a minute. BRISBANE, Australia (CNN) -- Imagine a gun that fires a million rounds a minute -- enough to shred a target in a blink of an eye, or throw up a defensive wall against an incoming missile. Its inventor is Mike O'Dwyer, a one-time grocer in the Australian city of Brisbane. He's spent 30 years and much of his own money to develop the technology. Now, finally, the doors are opening for him at the Pentagon, the U.S. Defense Department's headquarters. O'Dwyer says that the real value comes from Metal Storm's electronic capability to deliver rates of fire and different types of projectiles very precisely. The weapons range from a handgun that can only be operated by an authorized user to a grenade launcher that can fire either lethal or non-lethal ammunition. While much of the technology is a closely guarded secret, the firing mechanism has no moving parts. 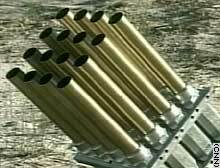 Instead, it uses electronic ballistics technology. Unlike other guns, the only parts which move are the bullets. The Metal Storm handgun employs electronic locking, which can limit firing access and stop unauthorized use. It can even be programmed not to fire within, say, the grounds of a school. Its grenade launcher can give the same defensive security as a minefield, but without physically putting any explosives in the area being guarded. Instead, sensors can alert an operator to any intrusion. The operator can then decide whether to use lethal or non-lethal grenades to warn off -- or destroy -- the intruder. O'Dwyer is a passionate advocate of applying technology to modern warfare and the rise of networking in defense thinking. A 16-pod grenade launcher -- one of the Metal Storm range. "Where network-centric warfare is going is moving the principal systems of weapons from the big, heavy, slow stuff to the small, light, fast, inexpensive (weapons), many of (which) -- and here's the important part -- is very smart." It's this promise of speed and flexibility that has got the American and Australian military to commit $60 million in research and development funding for O'Dwyer's array of weapons. Metal Storm started in a small Brisbane workshop, where all the prototypes have been built. Increasingly, the project looks to the United States, where most of its staff are now based and where it hopes to clinch sales to defense agencies and police forces next year. Going global has been in O'Dwyer's sights for many years. It's a target that gets a little larger and a little closer every day.